Size: 5.2" x 4.2" x 0.9"
This TI-1796+ increased the display capability of the otherwise identical TI-1795+ to 10 digits. The internal construction followos a conventional way with a housed calculator chip soldered on a huge printed circuit board (PCB). 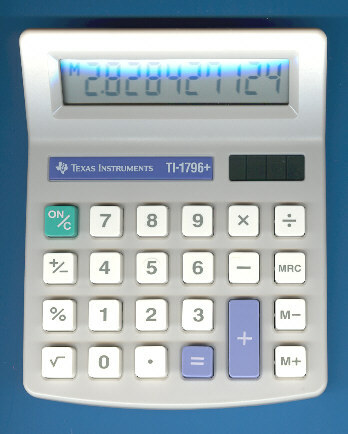 Within 3 years the TI-1796+ was replaced with the much more stylish TI-1796SV (SuperViewTM). Don't miss the first generation TI-1796 introduced already in 1986.